Hot Chocolate Mix is so easy to make at home, you’ll never buy premade mix again! 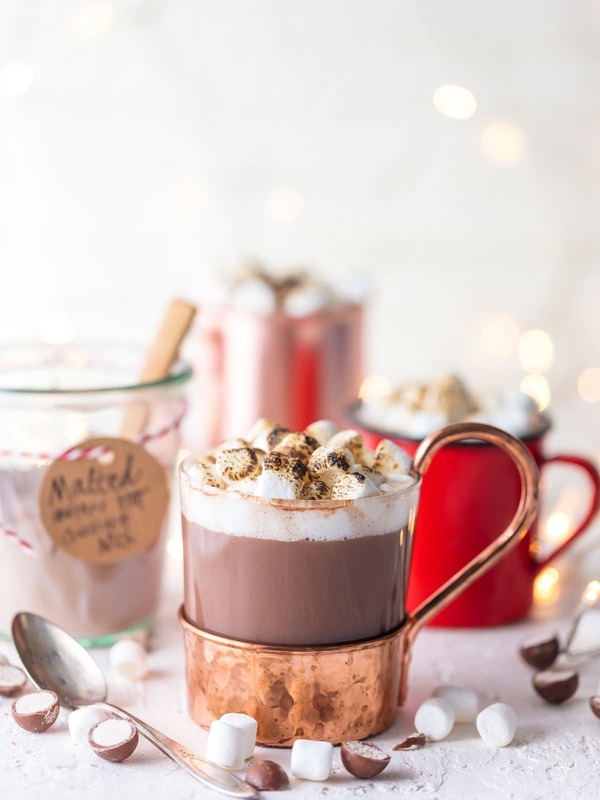 This Malted Hot Chocolate Mix Recipe is the perfect homemade Christmas gift, and it’s so easy to use. The added malt flavor in this homemade hot chocolate mix takes it over the top and makes it one of my favorite versions of hot cocoa! Homemade Hot Chocolate Mix is super easy to make, so fun to drink, and it makes the perfect gift. 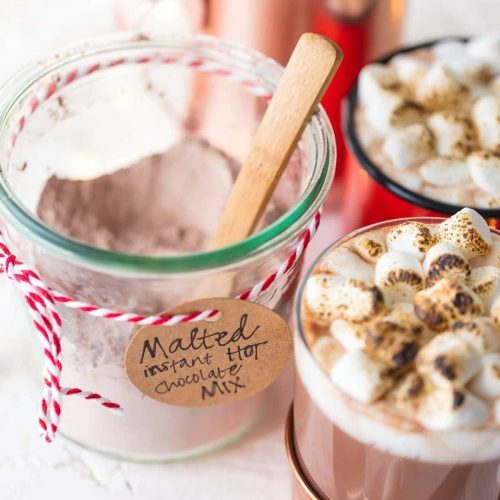 This malted hot chocolate mix recipe is one of the best flavors too! 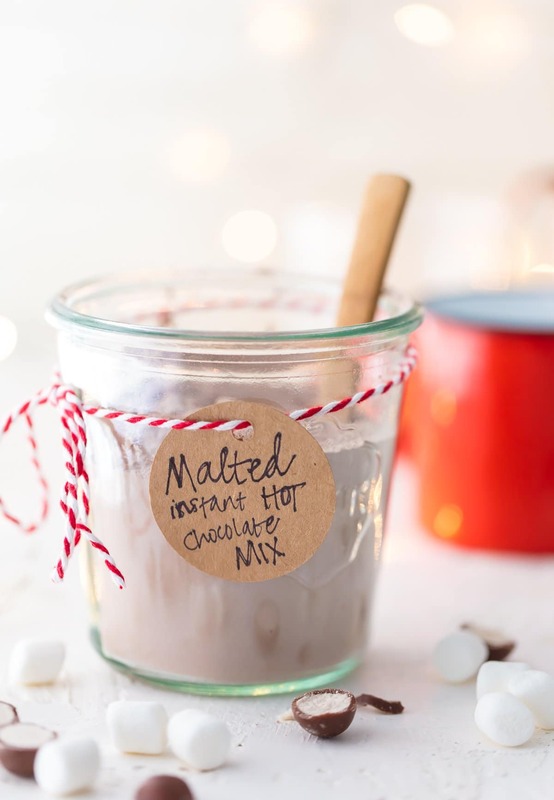 I just LOVE hot chocolate on cold winter nights, and this Malted Hot Chocolate Mix is my new favorite flavor. I have made a couple different flavors before, like Slow Cooker Peppermint Hot Chocolate and even Spiked Pumpkin Pie Hot Chocolate. But both of those are the type of hot cocoa that you make and have to drink right away. This recipe is for a delicious Instant Hot Chocolate Mix that lasts so much longer (up to 6 months! ), and you don’t have to wait around for a slow cooker to do it’s magic. Both styles are delicious, but I just love this easy option for making the perfect cup of cocoa. 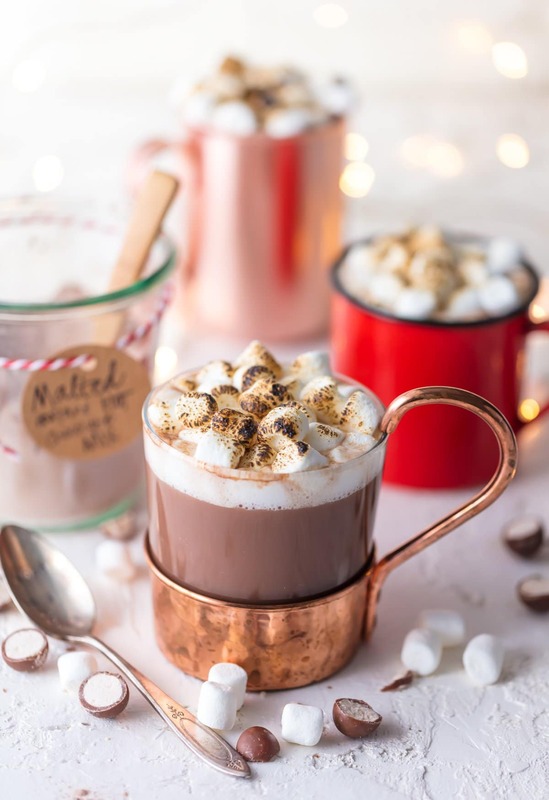 This Homemade Hot Chocolate Mix recipe is a great thing to make for your family, as a homemade gift to give to friends and family, or the as the perfect treat to hoard all for yourself. YUM! This Homemade Hot Chocolate Mix recipe is the perfect easy hot cocoa recipe. It’s absolutely delicious and you can make a cup of cocoa in a flash! Chocolate Malts are one of my favorite summer treats, so I wanted to recreate that in the form of hot cocoa. 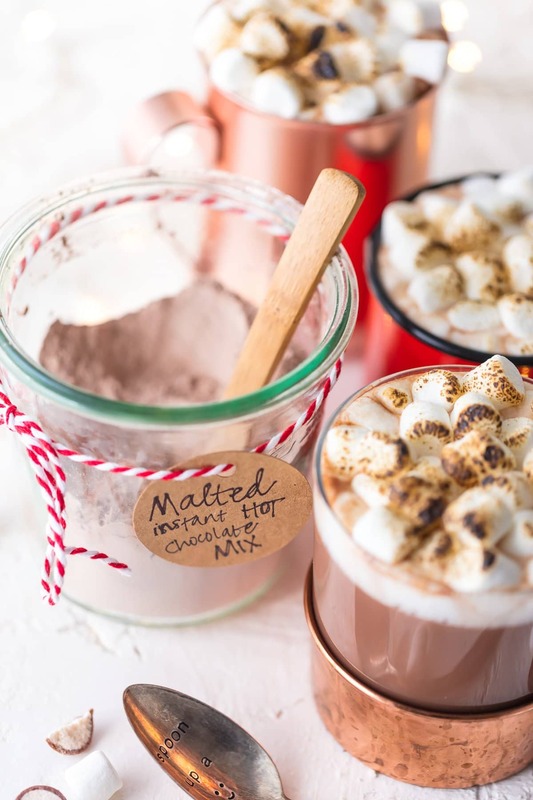 Now this Malted Hot Chocolate Mix recipe is a favorite winter treat! I love that little extra kick of flavor from the malt powder; it just takes this favorite classic up a notch and makes it an extra special treat for Christmas (or anytime during the winter). This homemade hot chocolate mix is easy, quick (instant even! ), and it warms the soul. That’s my kind of drink! As much as I love a fresh batch of hot cocoa, it’s so nice having an instant mix around so I can make a cup in a flash. On those super cold days, you just want to run in the house and get that warm drink ready in no time! That’s what’s so great about this homemade hot chocolate mix. Make it ahead of time, then it’s ready to use any time you want it throughout the season. Plus it makes such a great gift! You can easily fill up a cute jar with this mix, wrap it, and gift to anyone on your Christmas list. Making this homemade hot chocolate mix recipe is SO easy, and making a hot drink with it is even easier! That’s like, basically two recipes I’m sharing here, right? Well, each recipe is one step long, so…who really cares, because the point is that making homemade hot chocolate has never been simpler! 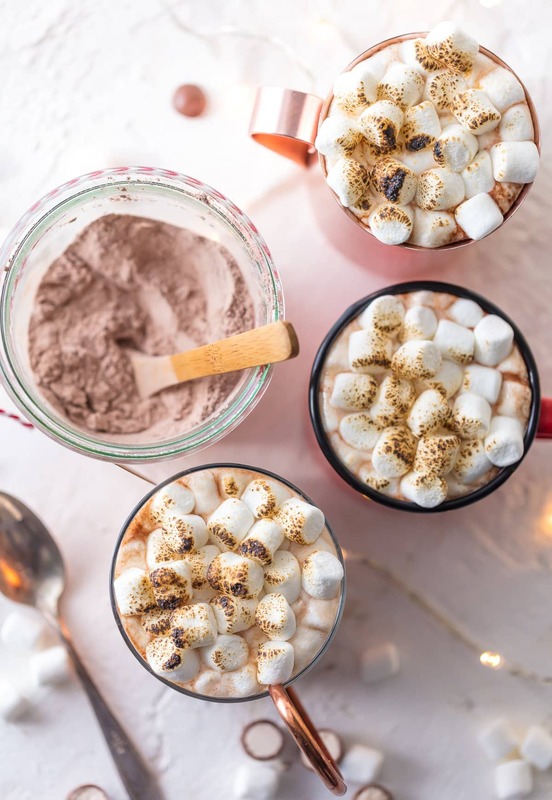 There’s no time to waste when it’s freezing cold outside, so prepare the mix early in the season, and then make a cup of hot cocoa as often as you like. Just sift all the ingredients together, and then whisk in the salt to finish mixing. Store the instant mix in an airtight container, and it will keep for up to 6 months. So you can use it all winter long! Heat 1 cup of water or milk to a simmer on the stove. Pour into a mug and stir in 1/4 cup hot chocolate mix. 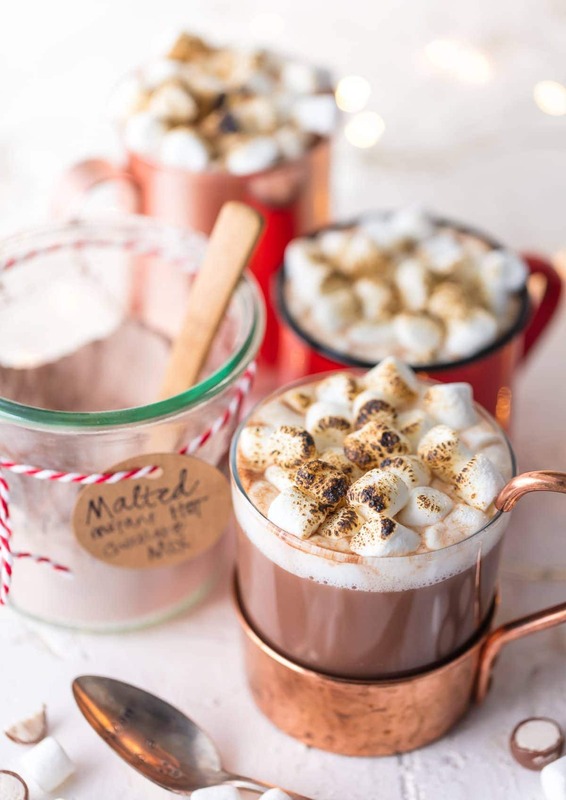 Top it off with mini marshmallows, add in some flavoring, or even make it an adult hot cocoa with liqueurs. 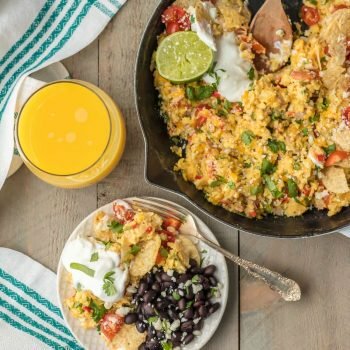 Easy, delicious, and so fun! Spoon in some homemade hot chocolate mix, heat up a glass, and start up a fire. Get cozy and enjoy a nice cup of Malted Cocoa…it just doesn’t get better than this! Well, I guess maybe you could add a S’more Cookie to the mix and then you might REALLY be in heaven. See the recipe card below for details on how to make Homemade Hot Chocolate Mix. Enjoy! Hot Chocolate Mix is so easy to make at home, you'll never buy premade mix again! 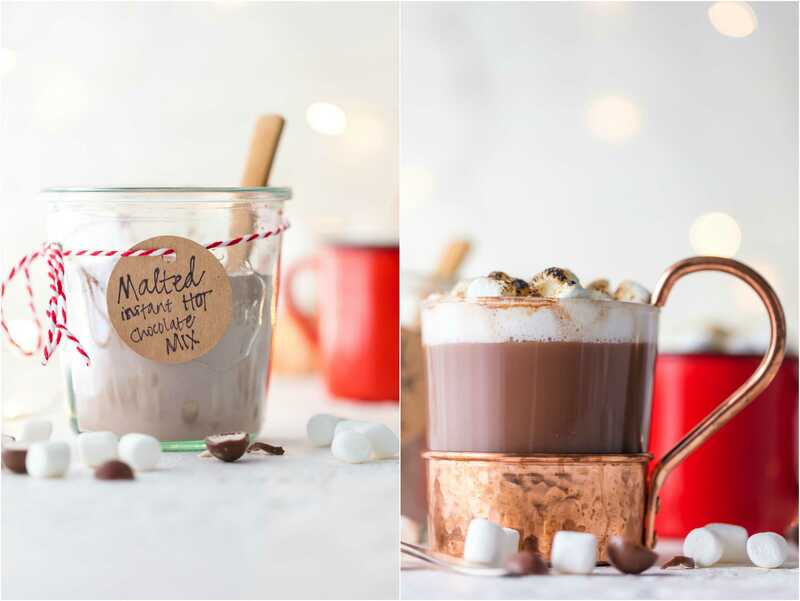 This Malted Hot Chocolate Mix Recipe is the perfect homemade Christmas gift, and it's so easy to use. The added malt flavor in this homemade hot chocolate mix takes it over the top and makes it one of my favorite versions of hot cocoa! 1 1/2 cups malted milk powder chocolate **See note. Sift all ingredients (except the salt) in a large bowl. Add the salt and whisk all ingredients until thoroughly combined. Transfer to an airtight container and store at room temperature up to 6 months. To serve, bring 1-cup hot water or milk just to a simmer. Pour hot liquid into a mug and mix in ¼ cup Hot Chocolate Mix (or to taste). *Note: For best results, shake the hot chocolate mix to incorporate separated ingredients before each use. **Note: If regular hot chocolate mix is desired, leave out the malted milk powder and use 2 cups nonfat dry milk powder instead. Absolute YUM YUM YUM!! I will be making this!! Thank you for sharing!!! Thanks so much Sophie! Happy holidays! Where can I buy the Malted choc powder? You should be able to buy it at any grocery store, for us it was located by the ice cream toppings. I would just ask someone at customer service and save the stress of searching. I hate wandering around!! Hope you love the recipe! Looks yummy! Have you tried Best Ever Creamy Crockpot Hot Cocoa? I will try to email you the recipe! Saw your email! I LOVE recipes like that, thanks for sending! I do have a crockpot version, Slow Cooker Peppermint Hot Chocolate if you want to search for it on the site. It’s made with sweetened condensed milk and so creamy!